This tutorial will guide users through the process of developing and deploying a web application on version 1.3.5 of Google's AppEngine for Java using the reference implementation of the "Contexts and Dependency Injection (JSR-299)" API - JBoss Weld. JBoss Weld is designed to be used in a Java EE container such as Geronimo, Glassfish, JBoss AS, WebLogic, WebSphere, etc. with JavaServer Faces 1.2 and above. The extension-based approach employed by the JBoss team developing the reference implementation for JSR-299 makes it relatively easy to use Weld in other environments such as Java SE or a standard Servlet Container such as Jetty or Tomcat. You can download the Google AppEngine SDK v1.3.5 and install it locally on your system; however, this tutorial is written from the Eclipse perspective using the Google Plugin for Eclipse. The following steps should be performed in advance of the process outlined below. Download and install Eclipse SDK 3.6. Follow the instructions outlined on the "Quick Start" page to install the Google Plugin for Eclipse. From the 'New' sub-menu on the 'File' menu, select the "Google Web Application Project". Give your project a name in the 'Project Name' field. 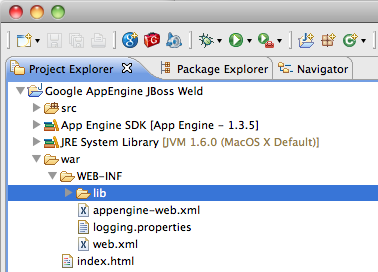 For the purposes of this tutorial, we will use "Google AppEngine JBoss Weld". Enter your project's default package name in the 'Package' field. For the purposes of this tutorial, we will use "com.wildstartech.gae.weld". Edit the appengine-web.xml file found in the WEB-INF directory of the project to allow the web application to store data in the session created for clients visiting our site. Add the <sessions-enabled>true</sessions-enabled> line as shown below. Edit the web.xml file found in the WEB-INF directory of the project to add org.jboss.weld.environment.servlet.Listener class ServletContextListener, ServletRequestListener, and HttpSessionListener. A Google App Engine web project will, by default, setup the index.html file as the default file for your web application. In the section above, we specified a change to the <welcome-file-list> configuration parameter which instructs the App Engine's runtime environment to look for the index.jsp page as the default page. As such, we we will rename the AppEngine's default index.html file to index.jsp. Locate and right-click on the index.html file in the war directory shown in the "Package Explorer" window. When the context-sensitive menu is displayed, left-click on the 'Rename...' menu item. 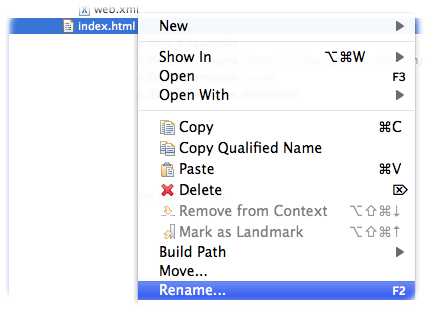 When presented with the "Rename Resource" dialog, ensure the 'New name:' field indicates the index.html file should be renamed to index.jsp. Bryzak, Shane. 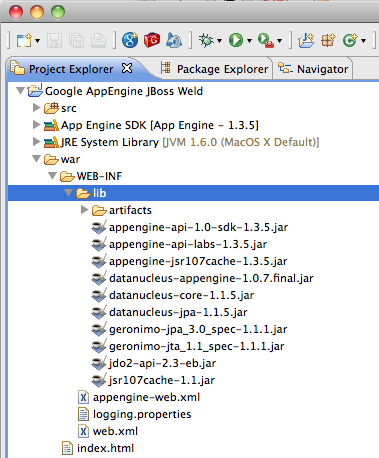 "Weld, JSF 2.0 and Google App Engine - Navigating the minefield (Part 1)" http://in.relation.to/Bloggers/WeldJSF20AndGoogleAppEngineNavigatingTheMinefieldPart1 05 Feb 2010. 05 Aug 2010.